EU foreign ministers on Monday discussed how they could persuade the US not to pull out of the Iran nuclear deal, but stopped short of imposing new sanctions on Tehran. Britain, France and Germany used a meeting of the EU's 28 foreign ministers to try to build support for expanding sanctions against Iran to punish it for its role in the conflict in Syria. They hope that by doing so they will persuade US President Donald Trump not to follow through on his threat to abandon the landmark 2015 deal to curb Iran's nuclear ambitions. Danish Foreign Minister Anders Samuelson said there was "a very broad majority" in favour of expanding sanctions, as the clock ticks down to a May 12 deadline imposed by Trump to "fix" the agreement. Simon Coveney, the Irish foreign minister, said there was a need to "send a strong signal to Iran that we're concerned in relation to some of their activity particularly in Syria". 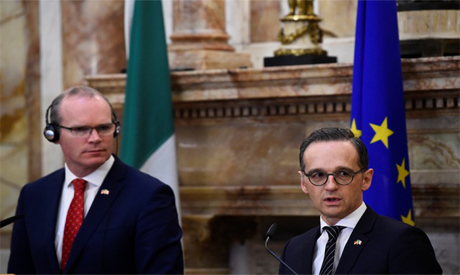 "But also to send a message to Washington that we share their concerns in some of those areas," Coveney said after the talks in Luxembourg. Targets for new sanctions could include both Iranians and also non-Iranian militias in Syria, an EU diplomat said. But any decision on sanctions would have to have unanimous support from all 28 EU states and so far several, including Italy and Sweden, are not convinced. "There is no consensus at the moment on the fact that these measures would be useful in this moment or appropriate in this moment," EU diplomatic chief Federica Mogherini told reporters. "I don't exclude that this will happen in the future but it's not the case today." German Foreign Minister Heiko Maas said the question of expanding sanctions would "remain on the agenda" in the coming weeks. Another EU diplomat said the aim of Monday's talks was to build political support for new sanctions and the effort would continue in the coming weeks. The EU is desperate to preserve the Iran nuclear deal, seeing it as the best way to stop Tehran getting the bomb. French President Emmanuel Macron and Germany's Chancellor Angela Merkel will both visit Washington on separate official visits before May 12, in part to lobby Trump on the issue. Trump has long derided the deal as a capitulation to Tehran and has declared it no longer is in US interests to maintain the sanctions relief his predecessor Barack Obama granted Iran in return for controls on its nuclear programme.